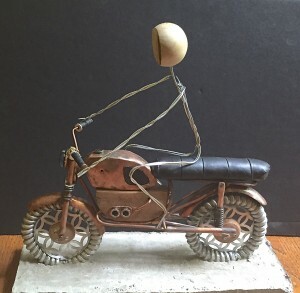 The little motorcycle sculpture is now ready for its art doll riders. This past week I added all the remaining parts and pieces that a motorcycle enthusiast would expect to find. The art doll riders will sit on their padded “leather” seat and grip copper, hardware, and polymer clay handlebars. 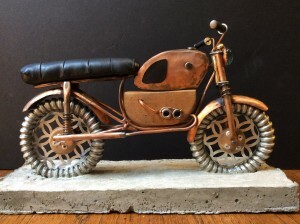 The addition of a button shaped brad gas cap, knee guards, tank rondel, a glass gem headlight, and brass brad gauges complete this miniature steampunk machine. As with most of my art dolls, the riders will start in my metal studio where I will hammer out their faces from a circle of copper stock. They are on the bench awaiting some sanding and polishing. In the meantime, I got started on twisting together the dolls’ wire skeletons. Here you see the beginning of the driver sitting on the cycle. 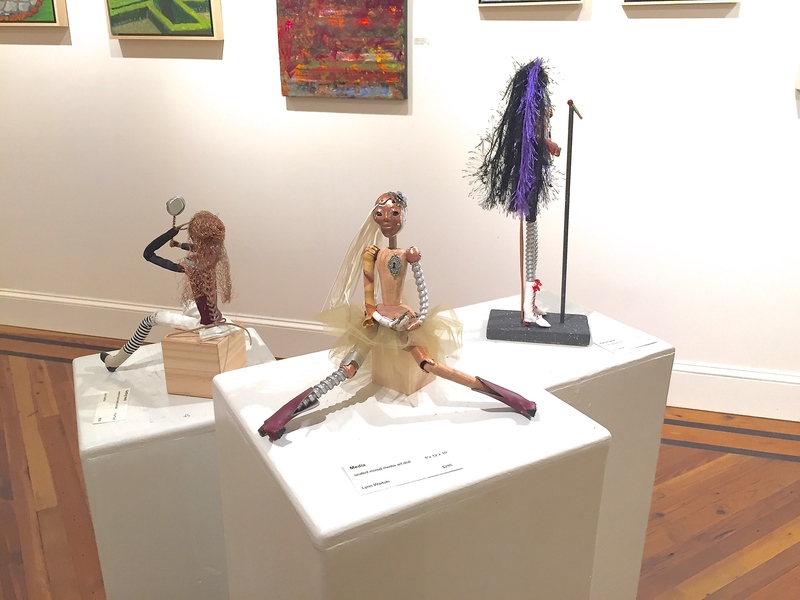 This is the last weekend for my featured artist show, “Our Art Is…“, with painters Eduardo Lapetina and Pat Merriman at the Hillsborough Gallery of Arts. The show runs through Sunday. It has been a fun show with lots of wonderful feedback. Several of the dolls will be making their way to their new homes when the next featured artist show installs on Monday. This entry was posted in Art Dolls, Art Shows and tagged art, art doll, Art doll show, Art show, copper, figure, figure sculpture, Hillsborough Gallery, mixed media, one of a kind, OOAK, sculpture, steampunk, the Hillsborough Gallery of Arts on June 19, 2015 by lynnadmin. The motorcycle looks great. I can’t wait to see the whole thing.